"This partnership is an ideal match," said Kevin Smith, President of HammerHead Trenchless. "Aarsleff has developed a technology proven to greatly improve how contractors rehabilitate laterals, and HammerHead, as part of the Charles Machines Works Family of Companies, has the ability to advance that technology globally. Collaboration between our organizations will allow us to expand availability and maximize impact of new innovations, like the Bluelight System, now and in the future." 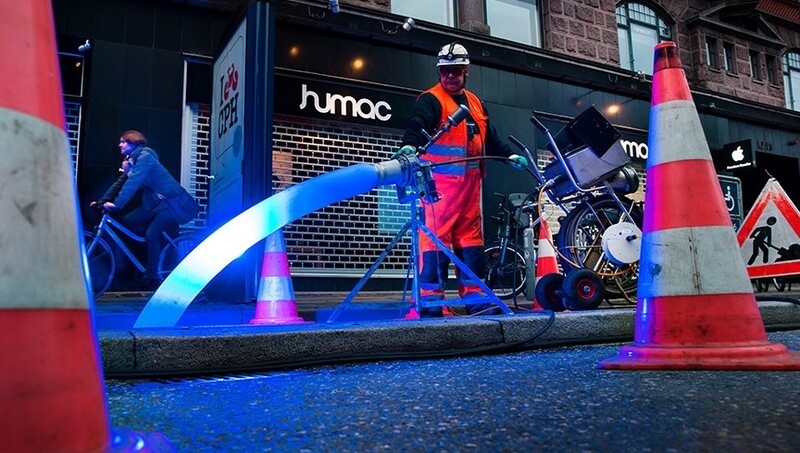 HammerHead Trenchless is a manufacturer and supplier of rehabilitation, replacement and installation equipment and consumables for the underground construction market. It offers a broad range of trenchless solutions including quality equipment and materials, technical field support, and comprehensive training services to customers around the world. The agreement grants HammerHead exclusive rights to produce and distribute the Bluelight product outside of Europe and Russia. Per Arsleff A/S is a top Infrastructure Contractor in Europe with extensive experience in trenchless applications. Its trenchless division, established in 1978, produces and employs its own CIPP liners, resin and installation equipment, including the Bluelight LED Curing System for 4" to 10" laterals. With more than 50,000 installations completed in Europe, the Bluelight system has a proven track record of quality and reliability. Per Aarsleff Pipe Technology Divisional Manager Hans Christensen said, "Our continued success utilizing the Bluelight system demonstrates that LED can transform the CIPP process for customers around the world. We have found a strong partner in HammerHead and we look forward to expanding the availability of Bluelight curing technology beyond Europe. This partnership is the beginning of many developments in the ways we can renovate pipes." The agreement grants HammerHead exclusive rights to produce and distribute the Bluelight product outside of Europe and Russia. The Bluelight product line is currently being adapted and certified for the North American market and is expected to be available in 2019. Per Aarsleff Pipe Technology will continue to sell the Bluelight product in Europe and Russia under the Bluelight brand name.